West Bengal Health Recruitment Board has started online applications for the post of Staff Nurse Grade II under the control of the Directorate of Health Services, Health & Family Welfare Department, Government of West Bengal. The aspirant can apply before the closing date of application i.e 26th Sept 2018. More Information About West Bengal Staff Nurse Recruitment and other details like Eligibility, Application form and admit card follow the post. Registration and Application form will be on the official site. Interested Candidates can directly apply online by the given link. Follow the post to check the schedule and to know more about the Staff Nurse Grade II Exam. Candidates are requested to follow the website (www.wbhrb.in) time to time for any update information. General Nursing and Midwifery/ Basic B.Sc. (Nursing)/ Post Basic B.Sc. (Nursing) the course passed from any Nursing Training School/College of Nursing recognized by both the Indian Nursing Council and the Respective State Nursing Council. Registration as Female/Male Nurse Midwifery from West Bengal Nursing Council. (Please note that the candidates who will be completing Nursing Course by September 2018 are also eligible to apply subject to production of Permanent Registration at the time of joining if selected). Must know Bengali/Nepali-Spoken and written. Age: Between 18 & 39 Years of age as on 01.01.2018, Relaxable for Schedule Caste/ Schedule Tribe/Other Backward Classes and person with disabilities as per Government Rules and Orders. Note*: Candidates have to upload the Nursing Council Certificates. Registration has been started on the official website, candidates who wish to apply for Staff Nurse Grade II Exam can directly apply online. Council will only accept online application. Aspirants are requested to submit their application before the last date i.e 26th Sept 2018(before 8 pm). Application received after the closing date shall be rejected. There are total 7615 vacancies in total. Note: Money Order, Cheque, Bank Draft, Cash etc. shall not be acceptable. No application shall be considered unless accompanied with the requisite application fee. Step 5. Download your Admit card. Admit cards are available to download from the official website. Applicants are required to use their Registration no. & registered mobile no. to download the admit card the site. please go through the instruction on the admit card before your exam. 33% of the post of Staff Nurse, Grade II shall be filled up from regular B.Sc. 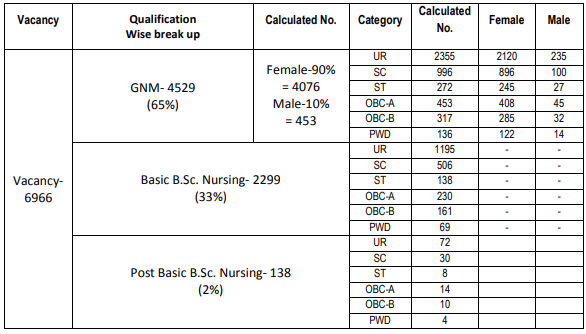 passed female candidates, 2% from regular Post Basic B.Sc. Nursing passed female candidates, 65% from General Nursing and Midwifery passed candidates amongst which 90% from General Nursing Midwifery passed female candidates and 10% from General Nursing Midwifery passed male candidates. Seat allotment for Staff Nurse Grade is given below. Bharti 2019 Copyright © 2019.